The football/soccer map of LA is about to change a whole lot by 2018. 4-time champions Galaxy are to finally have a worthy derby rival. Will Los Angeles FC raise to the challenge? Their stadium should. When opened in 2003, StubHub Center was arguably the best MLS stadium and Galaxy soon raised to become one of USA’s most recognized teams worldwide. Along MLS strategy a second franchise was awarded to Chivas USA, the club targeted at the Mexican minority of California. That attempt eventually failed as the club seized to exist. A new entity, LAFC, will replace it in 2018. Aside from the more European image, the club will not share StubHub Center. 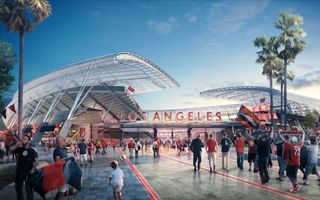 Instead, second football-specific stadium in Los Angeles is expected for completion before the 2018 MLS season, in a more prestigious location. It would sit beside the large LA Memorial Stadium, on the site of current Memorial Sports Arena. However, the location is yet to be approved. Along initial concept, the stadium could be partially open towards north-east, where the skyscrapers stand. This LA skyline view would be visible to a large portion of spectators. Around the building some 12,000 square meters (130,000 sqf) of public green areas are planned, improving the stadium’s perception to locals. The stands would encircle the field from all sides, though with a fairly irregular layout. Altogether it should hold 22,000 people and a large portion of that capacity would be dedicated to corporate viewers. Space beneath stands and directly adjacent the stadium would be used for shops, restaurants, museum of world football offices (altogether nearly 10,000 sqm / 107,000 sqf). The project should be built entirely with private funds and is estimated to cost $250 million. While no taxpayer money is required directly, LAFC owners expect public expense for surrounding infrastructure. In return they offer $2.5m per year in taxes, $129m annual economic activity from stadium operations and new jobs: 1,200 in construction phase and then 1,800 permanent ones.